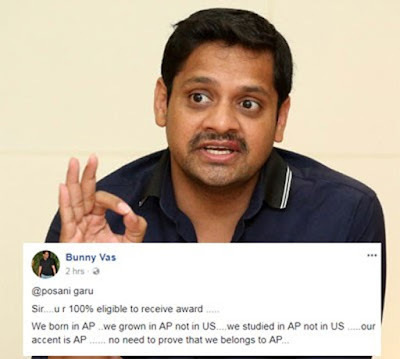 We were born in AP .. we grew up in AP not in the USA .... we studied in AP not in the USA ..... our focus is AP ...... no need to prove that we belong to AP. . "
He commented satirically on Nara Lokesh who wanted to differentiate actors and producers in Andhra Pradesh from the Telangana people and said that those who do not have to vote in Andhra Pradesh should not talk about the government's decisions. Andhra Pradesh. Bunny Vas has been a strong supporter of Mega Family and is a regular contributor to Geeta Productions and Allu Aravind. Well, the controversy seems to have plunged deeper into politics and caste-based division in the film industry.